From left: Remedios de Del Rio, Spanish Friends Governor and Vice President; Francisca Caracuel; Prof. Karen Avraham; Patricia Nahmad, Co-President of Spanish Friends; Marie Noelle Erize, Secretary of Spanish Friends; Ben Nemenyi. Spanish Friends of TAU hosted an entertaining fundraiser for its scholarship program at the Los Monteros Hotel in Marbella. With several prominent guests in attendance the event raised much-needed scholarship funds to help Spanish students study at TAU, in both undergraduate and graduate programs. The evening’s guest lecturer was Prof. Karen Avraham, Vice Dean of the Sackler Faculty of Medicine, who spoke about the groundbreaking research at TAU in general, and within her faculty in particular. 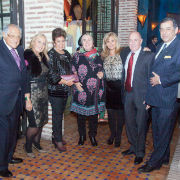 Among the more than sixty guests in attendance were: Francisca Caracuel, Third Vice President of the Provincial Diputation of Málaga and Deputy Mayor of Marbella; Rafael Cohen, Honorary Consul of Israel in Andalusia; Ben Nemenyi, Governor and Treasurer of Spanish Friends, and Patricia Nahmad, Co-President of Spanish Friends.